"Wallsy" - a Blues Legend and Premiership coach. Guernsey No. 42 (1967 - 1978). He was just sixteen years old when he played his first game for Carlton, and goaled with his first kick. Eleven seasons later, Robert Walls moved on from Princes Park as one of the greats of a fabulous era. A three-time Premiership player in 218 games, he notched 367 career goals, was vice-captain for five seasons, and captain for two. Late in his career, he crossed to Fitzroy to lead them into finals contention, before returning to Princes Park and further glory when he coached the Blues to the 1987 Premiership. Wearing guernsey 42, Walls took to the field his first senior game in 1967 against Fitzroy at Princes Park. Early in that match he marked strongly at full-forward, then calmly slotted the goal with his first kick. By the end of that debut season however, he was playing in defence, mainly because his immature frame was being too easily knocked out of marking contests. In a quality team, with the support of star defenders like Wes Lofts, John Goold and Ian Collins, Rob learned quickly. Weighing in at around 190 cm and 85 kg, he claimed a regular place in a back pocket, where his strong marking, judgement and pace off the mark proved real assets. Later, he would grow to 193 cm and fill out to 89 kg. Topping off an exemplary first season, Walls was a solid performer in both of Carlton’s finals matches that year. The Blues wound up the 1967 home and away rounds second on the ladder, behind Richmond. It was Carlton’s first finals campaign for five years, and inexperience was a factor in their quick exit after successive losses to the Tigers and Geelong. Twelve months later however, when the ’68 finals began with Carlton again sitting second – this time behind Essendon - the Blues were a physically stronger, better team. Before 116,828 spectators on a windswept MCG, Carlton went on to beat Essendon by 3 points in a dour, slogging Grand Final. Walls kept Essendon’s resting ruckmen under control all match, and accepted his first Premiership medal at just 18 years of age. Carlton’s key forwards in that ’68 Premiership team; Bill Bennett and Brian Kekovich, were both missing when the Blues began the defence of their title in 1969. By then a rapidly-maturing, seasoned performer, Walls was offered another opportunity at centre half-forward and never looked back. He had another impressive year as the Blues fought their way into their third successive Grand Final against their recent nemesis, Richmond. As usual, the Tigers came out hard from the first bounce, and the Blues met them head on. There was just two kicks in it with ten minutes to play, but Richmond finished stronger to win by 25 points. Walls’ fourth Grand Final in a row came in the fabled 1970 clash against Collingwood. The Magpies were warm favourites after comfortably accounting for Carlton in the second semi-final, and in front of a then-record crowd of 121,696 they bolted away to lead by 44 points at half time. Walls had been contained by his opponent Ted Potter until then, but in the second half of that amazing game he broke the shackles to be one of the prime movers as the Blues stormed home for a glorious ten point win. The emotional let-down after that famous victory took its toll the following year and the Blues missed the ‘71 finals by one place. Ron Barassi then called it a day after six memorable seasons and two Premierships at the helm of the Blues. His replacement was champion ruckman John Nicholls, who accepted the challenge of playing coach, with Walls as his vice-captain. Big Nick’s fresh approach bore fruit immediately, and Carlton finished two points clear of Richmond on top of the ladder after the home and away rounds of 1972. Carlton’s Premiership victory in ’72 stands firmly among this great club’s finest hours - because it was achieved by innovation, courage and sheer bloody-minded determination against the odds. In the first year of the McIntyre Final Five format, the Blues fought a draw against Richmond in the second semi-final, only to lose the replay by 41 points. While the Tigers enjoyed a week’s rest, Carlton had to quell a spirited St Kilda side in the Preliminary Final to earn another crack at Richmond on Grand Final day. This meant that the Blues – with just twelve survivors from the 1970 Premiership team, and all of them nursing battered bodies – had to win their fourth final in as many weeks to claim another flag, against a rested, confident Richmond at full strength. In the week prior to that extraordinary match, Nicholls and the Carlton match committee knew that a different strategy had to be found if the Blues were to have any chance. They decided on a bold ploy of all-out attack, with Nicholls himself, Walls and Alex Jesaulenko to be the targets up forward, and rising stars Bruce Doull and Geoff Southby in the key defensive posts. But the overall success or failure of the plan hinged on big-hearted ruckman Peter Jones, who was asked to take on the Richmond rucks single-handed. Jones responded with probably the best individual performance of his long career. More than 112,000 fans packed into the MCG on that memorable day, to see the Blues jump Richmond from the first bounce. Carlton’s eight goals in the first quarter were followed by ten in the second, and seven in the third. The game was over by three-quarter time, even though Richmond had scored a respectable 15.15 (105). The Blues had registered 25.9 (159)! The Tigers outscored a tiring Carlton in the last quarter, but at the final siren the margin was still 27 points in the highest-scoring Grand Final ever. Jesaulenko (7 goals), Nicholls and Walls (6 apiece); Jones, and Doull were all magnificent in a superb team win. Robbie Walls’ (and Carlton’s) fifth Grand Final appearance in six seasons came in 1973, and once again our opponent was Richmond. In their mind, the Tigers had been humiliated the previous year and they were burning for revenge. Barely five minutes into the game, John Nicholls was shirt-fronted by Tiger Laurie Fowler. 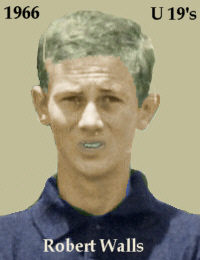 In the second term, full-back Geoff Southby was felled by an elbow that left him stretched out cold, and Carlton were blitzed from that point on. Richmond won by 30 points in a tainted victory. Walls, Gary Crane and David McKay were best for Carlton, each kicking two goals. The magnificent playing career of John Nicholls came to end in 1974 as Carlton faded to finish seventh. Big Nick continued as non-playing coach, and the Blues bounced back to second on the ladder in ’75. Walls had another good, consistent season; topping the Club goal-kicking table with 59 majors, finishing third in our Best & Fairest award and representing Victoria for a third time. It all ended in disappointment however, when Carlton were knocked out of flag contention by successive losses to Richmond and North Melbourne. And worse was to come. Just three days before the first round of the 1976 season, John Nicholls stunned the Club by announcing his immediate retirement. 'I have lost the drive to coach,' he said simply, ending a 22 year span as one of the Club’s great figures. Assistant coach Ian Thorogood took over the reins and remarkably, the Blues were minor premiers. But for the second year in a row, Carlton were bundled out of the finals by straight sets losses to Hawthorn and North Melbourne. Walls’ consistency brought him 55 season goals and confirmation of his standing as one of the very best key forwards in the game. It also brought him the honour of captaining The Blues in 1977. Unhappily for Walls, his debut year as on-field leader was not a particularly enjoyable one. Thorogood was unable to get the best from a talented, disparate playing list, and the Blues never looked like making the finals. Rumbling discontent among players, members, and the club committee saw Thorogood axed in late ’77, replaced by former St Kilda champion Ian Stewart. But Stewart found the task no easier than his predecessor. After three losses in as many games in 1978 he suffered a heart attack and resigned. Amid all these ructions, Walls decided that his future lay elsewhere. He applied for a clearance to Fitzroy after Round 5, and Carlton reluctantly agreed to release him. He was 27 years old; still an elite footballer, with plenty to offer the Royboys. He proved to be a real bonus for Fitzroy, adding crucial height and experience to their attack. In three seasons he played another 41 games, scoring 77 goals before a chronic knee condition ended his playing days. Almost immediately after hanging up his boots, Walls was appointed coach of the Lions and took the perennial strugglers of the competition into the finals in three of his five years at Brunswick St. While Walls plied his trade at Fitzroy, Carlton had added three more Premiership Cups to our trophy cabinet; in 1979, 1981 and 1982. Former Hawthorn champion David Parkin had coached the Blues to two of those flag wins, but by the end of the 1985 he knew it was time to move on. Meanwhile, Walls had impressed the Blues with his innovative approach to guiding the Lions. Discussions commenced between Carlton and Fitzroy, and a deal was eventually struck to swap coaches. For Walls, his return to Princes Park was perfectly timed. The Blues were on the rise again under a stable administration, and a strong side was about to be improved further with the addition of star recruits Stephen Kernahan, Peter Motley and Craig Bradley. Carlton wound up the 1986 regular season third behind Hawthorn and Sydney, with David Parkin’s Fitzroy fourth. Carlton beat Sydney in the Qualifying Final, before causing a huge upset by accounting for Hawthorn in the second Semi. Hawthorn in turn had to overcome a plucky Fitzroy in the Preliminary Final to claim a rematch with the Blues for the flag. Carlton started slight favourites on Grand Final day, but with their star full-forward Jason Dunstall unstoppable up front, Hawthorn were just too good. The Blues had every reason to be confident of going one step further in 1987, only to be rocked by twin tragedies. First, popular back-pocket Des English was diagnosed with leukemia, then budding champion Peter Motley was grieviously hurt in a serious traffic accident. Walls somehow kept his devastated team focused on their mission, and subtly used the misfortune of their team-mates as a spur. Carlton topped the ladder, and went on to destroy Hawthorn by 33 points in a one-sided Grand Final. It was Carlton's’ 15th flag, and 'Wallsy' at last had joined the ranks of Premiership coachesRegrettably, the joy of that Premiership lasted less than a season. The Blues ended 1988 third on the ladder, and impressed everyone by crushing Collingwood in the Qualifying Final. They then lost to Hawthorn and Melbourne in successive weeks to crash out of contention. Walls was said to be disgusted by what he saw as a lack of moral and physical courage in those two defeats, and let every member of the squad know about it. Rather than rallying the team, the criticism was deeply resented by a number of key players and they apparently just switched off. Carlton lost eight of their first ten games in a horror start to season 1989, and Walls was promptly sacked. It was a regrettable end to a memorable career at Princes Park, made more so by his induction into the Carlton Hall of Fame later that same year. In 1991, after a well-received period as a football commentator on radio, Walls accepted a plea from the AFL to coach the troubled Brisbane Bears. Based at Carrara on the Gold Coast and privately-owned by local Hotel magnate Rueben Pelerman, the Bears were on the brink of extinction. Walls took up the challenge in Queensland because like his former mentor Ron Barassi, he was a passionate supporter of the concept of a truly national AFL competition. In his five seasons up north, he battled adversity and apathy at every turn. But there can be no doubt about the selfless contribution he made to the process of returning the Bears to a more traditional membership-based structure. Nor that he coached them into the finals for the first time in 1995, and helped lay the foundations for their eventual relocation to the Gabba in Brisbane. Walls coached his fourth club in 1996 at Richmond. The almost perennially-troubled Tigers proved more than a handful however, and Rob resigned from Punt Rd after just two seasons in charge. His training as a schoolteacher in his earlier years then stood him in good stead, when he returned to a full-time career in the media. By the dawn of the new century, his incisive work as a commentator on television, in radio and newspapers had gained him further respect and wide appreciation. He was honoured once more by the Blues in May 2000 when he was named in a forward pocket in Carlton's Team of the Century, and in June, 2006 he was inducted into the AFL Hall of Fame. Five years later, Walls' ascension to the status of Legend was confirmed by the club. Robert's son David Walls played Reserve grade football for Carlton during 1996 and '97. Contributors to this page: Jarusa , PatsFitztrick , Bombasheldon , molsey , pblue , WillowBlue , p(12)terg , tralby , BlueWorld , Brushy , true_blue24 , nikki , steve and admin . Page last modified on Tuesday 23 of May, 2017 21:15:43 AEST by Jarusa. 1988 Rd 4 - Match Preview Vs Sydney.